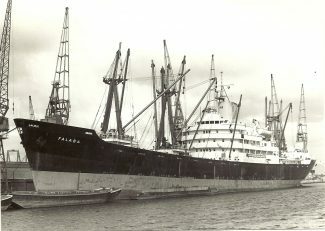 Falaba was built in 1962 for Elder Dempster. In 1959 Elder Dempster Lines Ltd, long established in the trade to West Africa out of Tilbury, ordered several new cargo liners to replace a number of older ships. 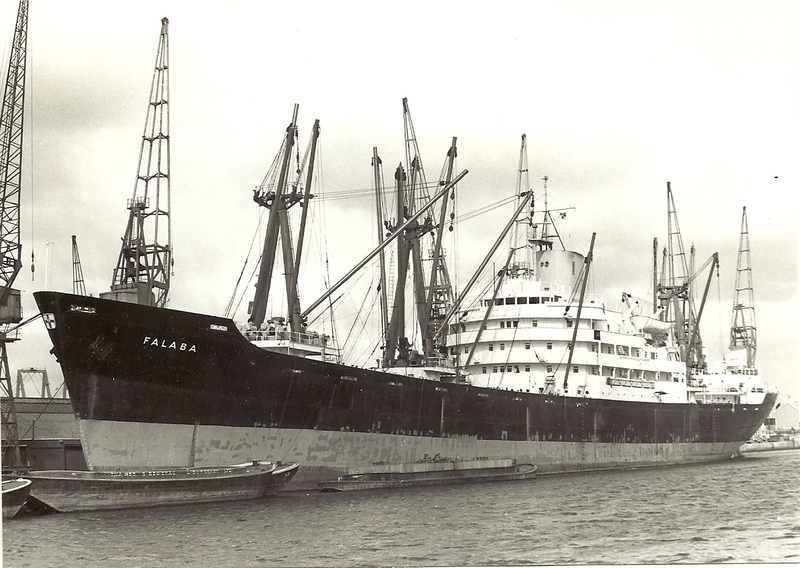 One of the new arrivals was the motor vessel FALABA (7703 tons gross, 8533 deadweight), built at Greenock in 1962. She was in West Africa service with Elder Dempster for 16 years, although not continuously out of Tilbury and in 1978 was sold to Mexico’s national shipping company. She stayed under the British flag and was managed by Reardon Smith of London under the name LEONOR MARIA. Apart from the change of name and owner (Linea Mexicana’s subsidiary Europa Ltd, of London), the vessel had a paint job. Its medium yellow funnel was changed to light yellow with a copy of the Mexican company’s houseflag, the hull was changed from black to grey, and on each side in large black letters was LINEA MEXICANA. Quite a change from its “dignified” appearance when it was FALABA. There were two more changes of owner — in 1980 as the Greek ALEXANDER’S TRUST and in 1983 as the Cypriot/Greek CITY OF ZUG. Under the last name she did not remain in service for long and was broken up at Chittagong, Bangladesh, in 1984.